There are many excellent tutorials and blog entries out there describing JSF component development much better than I am capable of. So, I'll just focus on what is needed to create this specific component. My instructions are based on NetBeans 6.0, but they don't including anything that is not possible to do in other IDEs, so you should be able to translate the instructions into your own IDE. We will keep the tag simple with one attribute, for, which will specify for which component the messages should be displayed. The signature of the tag will therefore be: <jc:alertMessage for="myForm" />. Class representing the user interface component with properties for each attribute supported by the tag. It's recommended to sub-class one of the existing components to avoid doing all the work yourself. Class representing the actual tag. Now that we know what to do - lets get on with it. 5. Add the javaee.jar from the GlassFish project (%GLASSFISH%/lib) to the library dependencies of the project. 6. Create the Java class for the UI component, AlertMessage subclassing the UIMessage component. 7. Create the Java class for the tag, AlertMessageTag subclassing the UIComponentELTag tag. 9. Create the Java class for rendering the tag, AlertMessageRenderer subclassing the JSF Renderer. (if present) should be diplayed by this component. You can use the component with Facelets by providing a Facelets Tag Library descriptor. 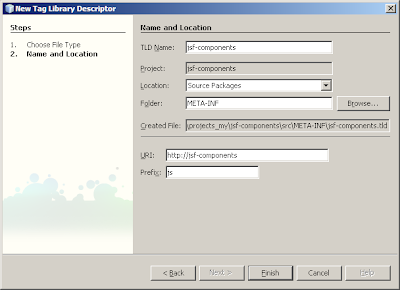 In this example I name the tag library descriptor mycomponents.taglib.xml and place in the WEB-INF/ directory. Nice writeup, will sure come in handy. Thanks for the explanation. suggest a excellent JSF create component tutorial, please. And post the link of the apache library. I like you post. It very good. I don't know to do. Which version of JSF are you using? This is a nice tutorial on creating custom JSF component. So I changed it to "components.alertmessage" because I figured there was not a ExtendedMessage object anywhere. Thanks for pointing out the problem with the component type. It was a mistake on my side when I transferred my code to the blog. I will fix the code in the entry right away. How would I use the same with Facelets ? What enteries are needed in taglib.xml . I am not sure which will come as component or handler class ? To use any custom component with Facelets you need to provide a tag library descriptor specifically for Facelets. The tag library descriptor contains the namespace and component and render type for each of your components in the library. Once the descriptor is complete you must reference it using the facelets.LIBRARIES context parameter in web.xml. I've added the instructions to the end of the blog. Nice article, got it to work!! Nice place to kick start working on building custom JSF components. I am using jsf ri 1.2 and jboss 5.0.1 GA. Thanks for help. It's a bit hard to see what might have gone wrong. Did you change any of the code, or did you copy it verbatim? jsf-components is the product of the blog entry. I haven't provided a pre-compiled output of the code. 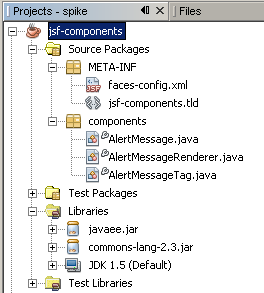 If you create the code as described in the blog, you'll end up with jsf-components.jar. No need to delete your posts - someone else might have the same issues as yourself. I've decided to create a project for my JSF utility library on Kenai. I'll post the URL once I've finished uploaded the library (20 -30 mins). 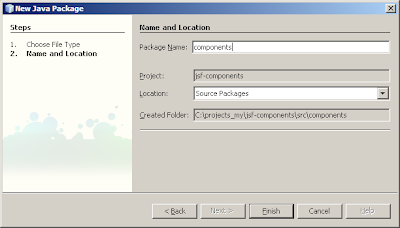 http://kenai.com/projects/i2m-jsf/downloads/directory/Version_1.0Simply add i2m-jsf-1.0.jar to your WEB-INF/lib directory and you are ready to go.